This work of narrative nonfiction includes a 4-page For Creative Minds section in the back of the book and a 30-page cross-curricular Teaching Activity Guide online. 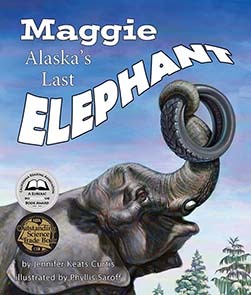 Maggie, Alaska's Last Elephant is vetted by experts and designed to encourage parental engagement. Its extensive back matter helps teachers with time-saving lesson ideas, provides extensions for science, math, and social studies units, and uses inquiry-based learning to help build critical thinking skills in young readers. The Spanish translation supports ELL and dual-language programs. The interactive ebook reads aloud in both English and Spanish with word highlighting and audio speed control to promote oral language skills, fluency, pronunciation, text engagement, and reading comprehension. 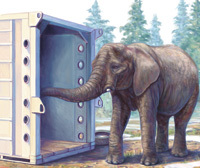 Vetters: Thanks to the following for taking such great care of Maggie and for verifying the accuracy of the information in this book: Pat Lampi, Executive Director at the Alaska Zoo; Michelle Harvey, one of Maggie’s keepers; and Performing Animal Welfare Society (PAWS) staff. A solid if not stellar addition to a growing picture-book genre. 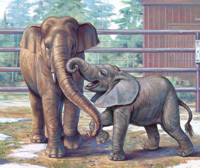 This is a beautiful informational story filled with rich, descriptive language that could be used not only in science to learn information about elephants and zoos, but could also be used during writing workshop too. 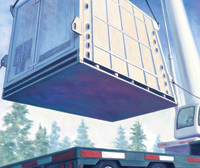 The text is filled with rich sentences that use beautiful sensory details. A great model for young student writers. A great text to be used for so many instructional lessons. 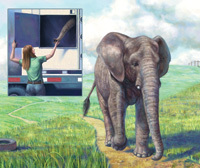 Maggie Alaska’s Last Elephant is a must read. This is a true story, well-told and nicely illustrated. 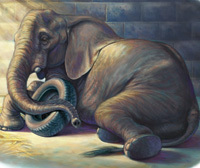 Combine it with the story of Ivan for discussions on how we care for captive animals, and how we can do better.